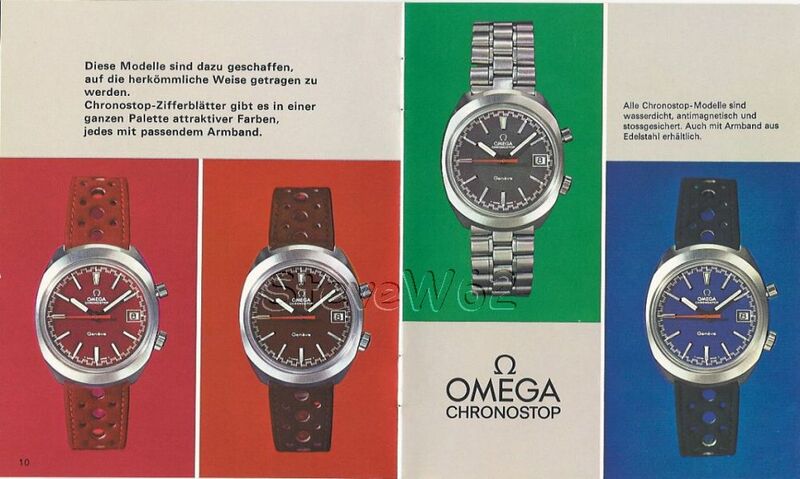 Omega Chronostop wrist watches are another interesting line. 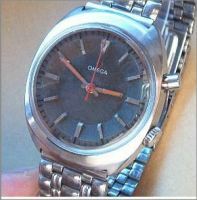 I bought mine, without knowing anything about this style of watch. 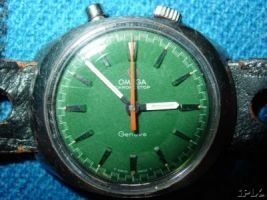 As usual, after studying the various watches available on eBay, it became apparent to me that there are quite a few variations available. 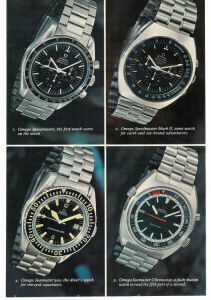 I started collecting some pictures & basic information on these watches. Here's a brief overview of my findings. 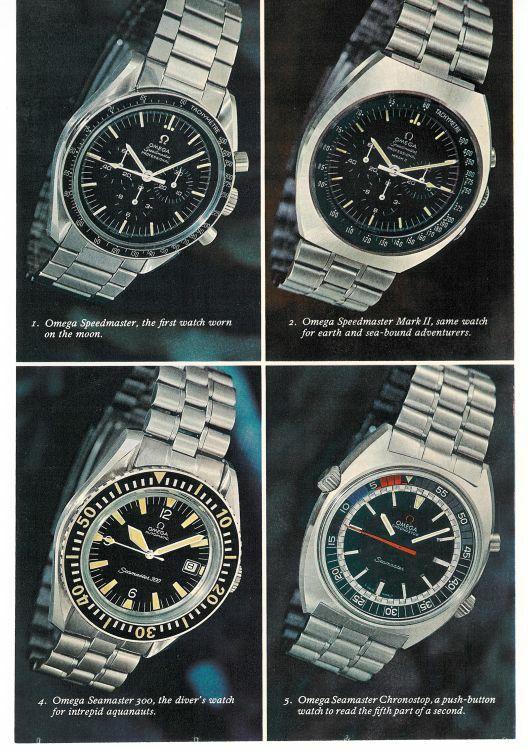 I only own one of these watches. So can only authoratitively state facts for that particular watch. 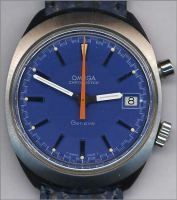 The book "OMEGA SAGA" doesn't even acknowledge the existance of this style of watch, listing only very brief movement details. 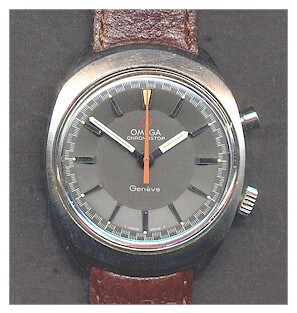 All other details I list have been "gleaned" from eBay auctions or from the Omega Museum Catalogue. Firstly what is a Chronostop watch ? 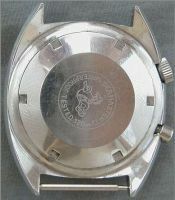 These are watches with a SINGLE pusher to operate a stop watch function. Press the pusher once to start the stopwatch hand. Press it again (& KEEP it pressed) to stop the stopwatch hand (& read the time) & release the pusher to reset the hand to zero. There is NO minute sub-dial. SO if you want to measure something for more than 60 seconds, you have to count the minutes yourself ! 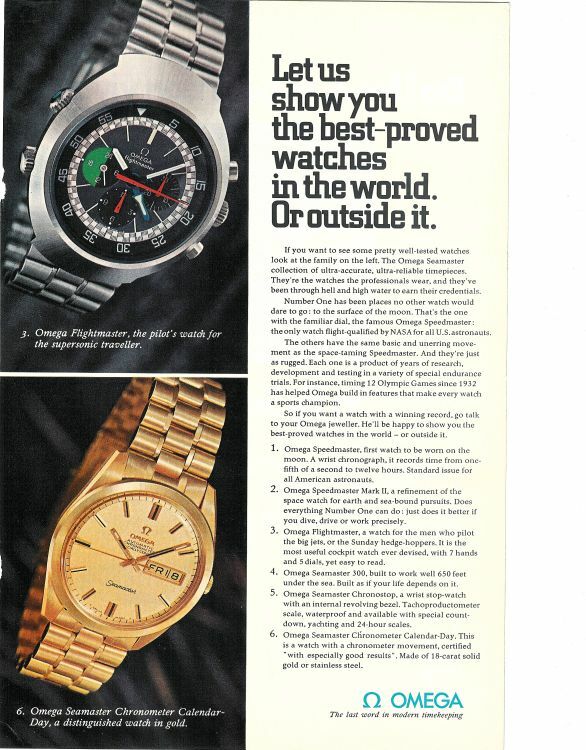 There is no continuous second hand on these watches. There are 2 movements that have been used in this watch series. The 865 & 920. Simply said, the 920 has a date & the 865 doesn't. Both movements are manual wind. 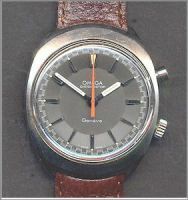 The various watches appear to have been available with a wide variety of dial & strap colours. At the end of the article are a couple of links to Chronostop brochures, If you're interested, I suggest you follow the links. They will show you some of the strap options that were available when the watches were new. 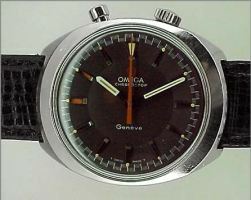 This line of watches has been used for Seamasters & Genève variations. OMEGA Chronostop Seamaster, 1966: Simplified chronograph, also called "Stop-Second Watch", displaying times to 1/5-second. 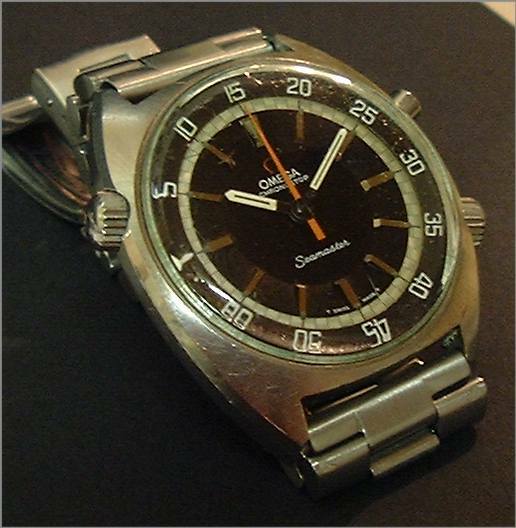 Calibre 865, push-button at 2 o'clock for start, stop (continued press to read time), return-to-zero (release button) and central chronograph hand. Case water resistant to 60 meters, fixed bezel with tachoproductometric, telemetric, decimal or pulsometric scale. 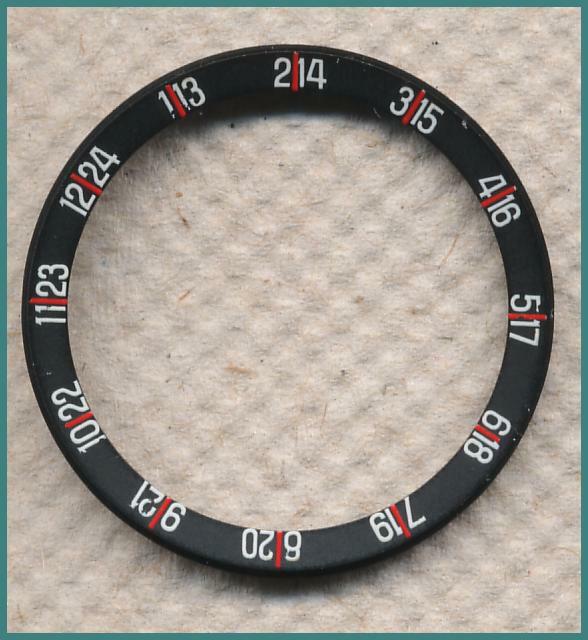 It would appear this watch came with a choice of non-rotatable inner bezel's. 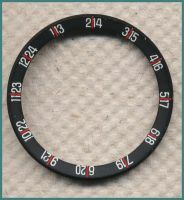 ... turning bezel with 0-60 or 0-24 scale, countdown or pilot. 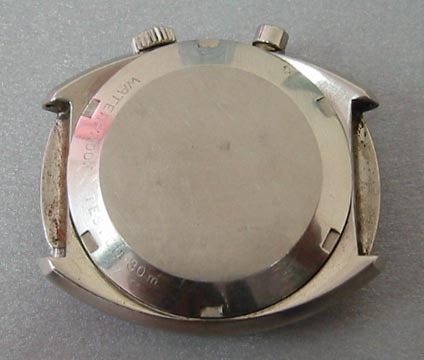 I can only guess that this was marketed as a divers watch, due to the rotatable inner dial. 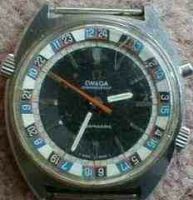 I own this watch (hence the bad pictures !). 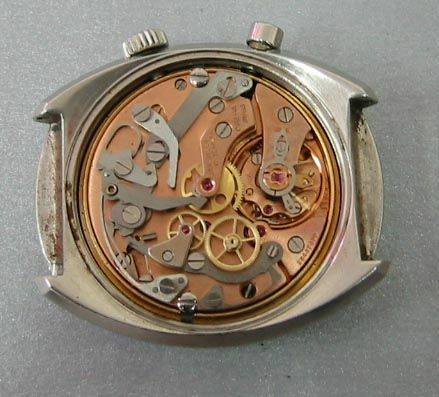 It has a "dished" dial & a rotatable (0-60 - this is the most common variation) inner dial (via the crown @ 10:00). 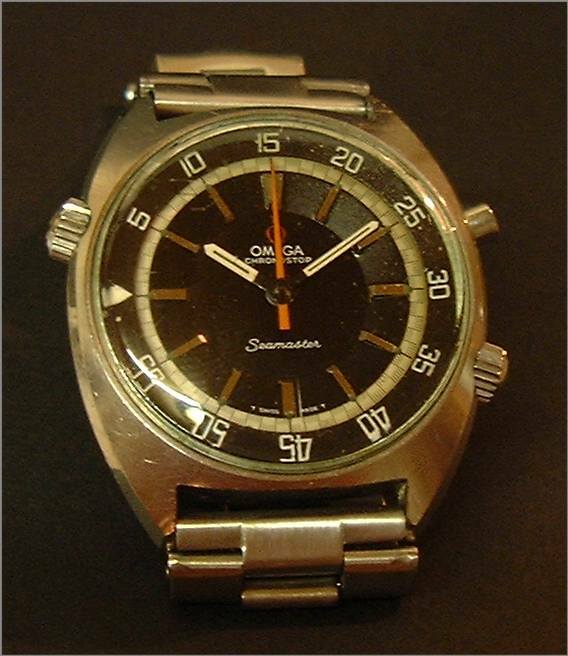 My watch dates from around 1968. The Omega description for this watch is as for the previous watches EXCEPT the Genéve models are only water resistant to 30M. I believe the 1st watch shown here has the wrong second hand. If you look at most of the examples shown on this page, you'll see that MOST have a broader red second hand. 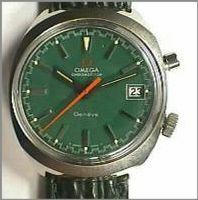 As you can see, this watch was available from Omega in a large number of Dial Colours. This watch is very similar to the previous watch shown, except that it has a Date function & therefore a different movement. 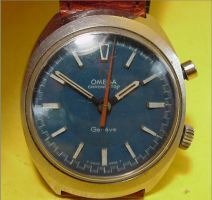 It has a blue dial. The seller stated that the watch diameter (without crown) is 35 mm. 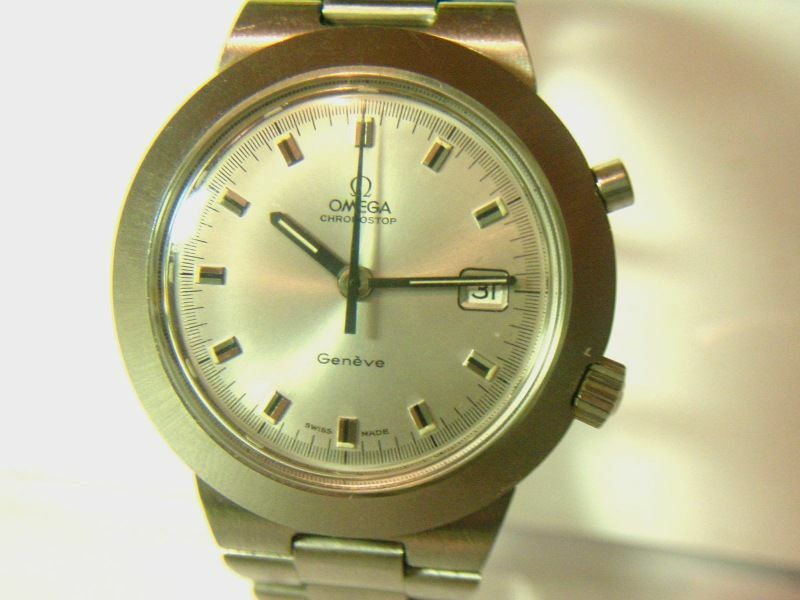 From the movement serial number listed, this watch dates from around 1970. Initially I thought it was the same as the watch on the right above, but check out the Hour indicators. They are clearly black for this watch & the watch above has white indicators. And here's a model that has been marked with the name of large Zurich retailer, "Türler". 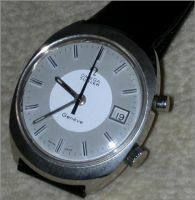 This is a real watch ! Notice the strap goes from left to right here ! 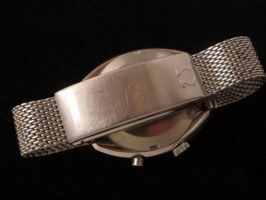 Case water resistant to 30 meters, designed to be worn under the wrist, with engraveable clasp. 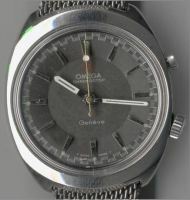 Omega marketed this version as the "DRIVER" model. NOTE :- DRIVER not DIVER . It was designed to be worn "under" the wrist, instead of in the normal position "above" the wrist. The thinking was that whilst driving ( with your hands in the 14:45 position ), you could read the time, without removing your hands from the steering wheel. I can't make out whether the purple dial is flat or dished. The case shape of this Genève Chronostop is completely different from all other watches listed on this page. 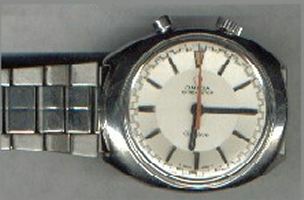 The bracelet is held on using the same system as used by Dynamics of the same period. There also appear to be a number of variations within this version. Notice the different dials colours & markings around the outside of the dial. 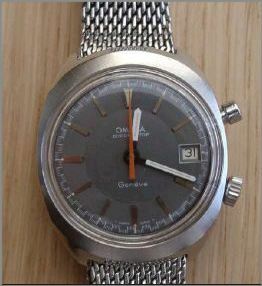 Simplified chronograph, also called "Stop-second watch", 1/5-second display. 920 date calibre, start push-button at 2 o'clock, stop (press during display of time) and return-to-zero (release) of central chronograph hand, silvered dial, outside line minute scale, raised hour markers with black fillet, luminous stick hands, round steel case water resistant to 30 metres, "Unicoc" system with wide bevelled bezel, with same bracelet fixing (here integrated) as the Dynamic. This watch was also available with a silvered dial with name of large Zurich retailer, "Türler", on it. 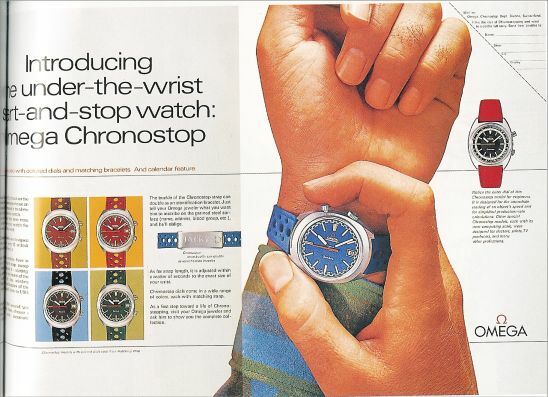 This is the only picture I have ever seen of a Chronostop with Orange hands. I have however seen the hands for sale on eBay. 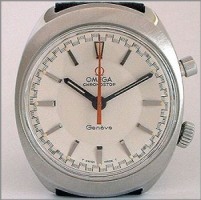 NOTE: this dial is marked neither Seamaster not Genève. So What's a 146.0011 ? We've covered the 145.007 - 145.010 & 146.012 So what is a 145.011 ? 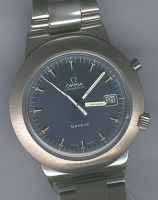 I don't know, I can't find a reference to it anywhere !, BUT Omega DO list a 146.011 as a Chronostop. Now read the description again ! 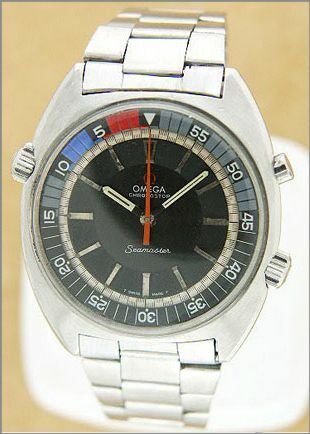 a 30 minute totalizer, a continous second hand in a sub-dial @ 6:00, a command button @ 6:00 ( bottom of the watch ! ), push buttons @ noon & a 930 movement ( NOT 920 !) 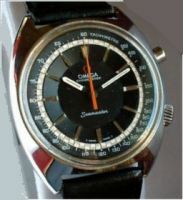 - This is the watch also known as a "Bullhead" Omega. I do not think this is a Chronostop watch. Again I only include it for the sake of completeness. Has anyone got one of these ? According to Omega, they also made an LED Chronostop. 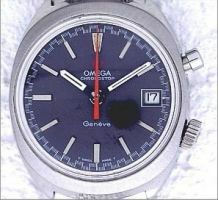 Whilst I doubt this watch has anything at all to do with the other models listed on this page, I include the details for completeness. 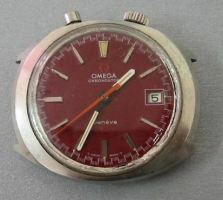 If anyone reading this happens to have an example or happens to be visiting the Omega Museum, I'd love to see a picture of it. 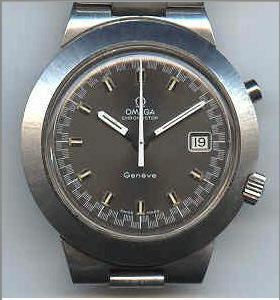 Chronostops came from Omega on a number of different straps/bracelets. Here are a couple of examples, scanned from the owners manual. And here is the mesh bracelet from behind. 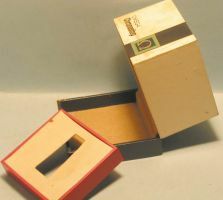 I found this picture on eBay of the box that a Chronostop came in. I don't know which model it initially housed. They also advertised via more normal means. Here are some magazine scans I've picked up along the way. 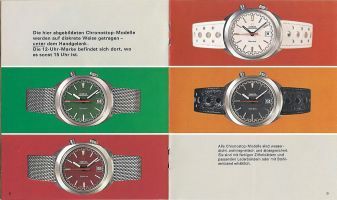 A 1968 Chronostop Brochure. Owned by David Alstott / hosted by Chuck Maddox. This brochure clearly shows the shows the Genève driver, Genève, Seamaster & Seamaster ( Rotatable inner bezel) models - All without the date feature. 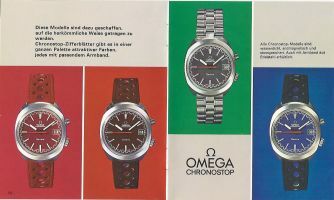 1969 - Chronostop In German. 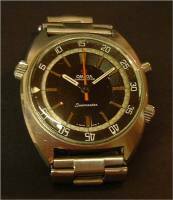 Features all Chronostop models available in 1969 including :- Drivers (under the wrist), Seamasters ( 865 Movements ) & Genèves ( 920 movements ). 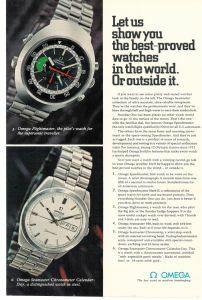 A 1972 General Omega leaflet. Owned by Me / hosted by Chuck Maddox. 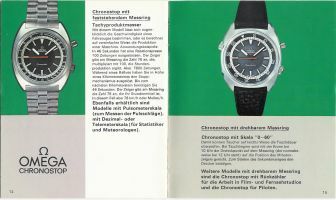 This Leaflet covers (amongst other things) The functions of Chronostops with/without dates & with/without inner rotating bezels. 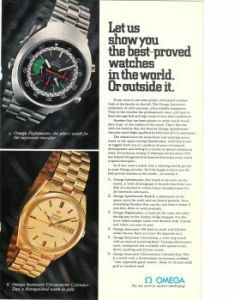 I know there's not a lot of information on this page, but I've not been able to find out too much information on this line of watches. Where possible, I have linked to other (much better) web pages. If you know of some that I've missed, please let me know. I'm a reasonable bloke. I make mistakes, I forget things. If I've got anything wrong here or missed anything ( I'm sure there are other dial/strap/colour variations out there ), please feel free to E-mail me.